Jason Gorczynski is a partner in the Real Estate practice. Jason counsels private equity firms, real estate investment trusts (REITS), developers, financial institutions and high net-worth individuals in a wide array of commercial real estate transactions, including stabilized, value-add and opportunistic profiles. He has substantial experience handling acquisitions, dispositions, preferred equity investments, joint ventures, development, financing, reciprocal easement agreements, long-term ground leases, sale-leasebacks and space leases. His practice spans hotels and resorts, industrial warehouse and distribution centers, multifamily apartment rental buildings, office towers (central business district, suburban and medical office buildings), residential and office condominiums, retail shopping centers, and mixed-use facilities. In addition, Jason represents both lenders and borrowers in a variety of real estate-based financing transactions, including senior, mezzanine, construction, permanent, condo inventory and portfolio financings. Jason has been recognized by Super Lawyers as a Rising Star in 2016, 2017 and 2018. 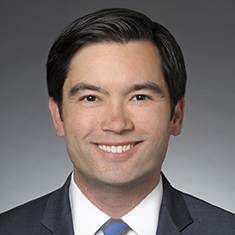 He is a co-chair of Katten's Chicago summer associate program and received an Annual Pro Bono Service Award in 2013 for his commitment to pro bono activities. While attending the University of Michigan Law School, Jason was a contributing editor of the Michigan Law Review. Representation of an institutional investor in connection with the portfolio management of five branded hotels located in San Diego, California; Sonoma, California; Durango, Colorado; Salt Lake City, Utah; and Seattle, Washington. Representation of a private equity firm in connection with the sale of a brand-managed luxury hotel in Arlington, Virginia, which hotel is part of a multi-owner development. Representation of a real estate client in connection with the acquisition of a full-service boutique business hotel and restaurant in Chicago, Illinois, which hotel is part of a multi-owner building. Representation of a private equity firm in the sale of a hotel, spa and golf resort in Scottsdale, Arizona. Representation of an institutional investor in the sale of an upscale hotel in Rochester, New York. Representation of a private equity firm in connection with the acquisition and subsequent sale of a luxury brand-managed hotel in Chicago, Illinois. Representation of an institutional investor in the sale of a full-service hotel and spa in Princeton, New Jersey. Representation of a real estate client in connection with the sale of an extended-stay hotel in Lombard, Illinois. Representation of a private equity firm in the sale of a four-star waterfront hotel in Tampa, Florida, which hotel is part of a multi-owner development. Representation of an institutional investor in connection with the acquisition and subsequent sale of a hotel resort and spa in Austin, Texas. Representation of a real estate fund lender in connection with the making of a mezzanine loan subordinate to securitized mortgage financing relating to a 3,350,000-square-foot 11-building industrial business park located in Rochester, New York. Representation of a public company lender in a mezzanine loan for ground-up construction of a mixed-use, condominium and retail development in New Orleans, Louisiana. Representation of a public company lender in connection with the making of a mortgage loan and a mezzanine loan, with subsequent sale of the mortgage loan, relating to the construction of an ultra-luxury residential condominium in Chicago, Illinois. Representation of a real estate fund in connection with a preferred equity investment relating to the construction of a multifamily apartment complex located in Colorado Springs, Colorado. Representation of a real estate fund in connection with a preferred equity investment relating to the construction of a residential condominium building located in Hoboken, New Jersey. Representation of an institutional lender in an inventory mortgage loan secured by ultra-luxury residential and commercial condominium units located in Manhattan, New York. Representation of a bank in providing senior mortgage financing secured by nine retail shopping centers in seven states. Representation of an institutional lender in a construction loan secured by a medical office building located in Alpharetta, Georgia. Representation of a specialty finance company in providing senior mortgage financing secured by 23 industrial buildings in three industrial parks in the Kansas City metropolitan area. Representation of the lead bank in a syndicated construction loan secured by a luxury shopping mall in San Juan, Puerto Rico. Representation of the Philadelphia Union MLS team in connection with loans from Goldman Sachs to refinance the team’s arena. Representation of a real estate client in connection with obtaining a construction loan to finance the construction of a 230,000-square-foot state-of-the-art headquarters in Long Island, New York, which loan converts to a mini-perm loan upon completion of construction. Representation of a public company client in connection with obtaining a loan secured by two office buildings in Scottsdale, Arizona. Representation of an institutional investor in connection with obtaining a loan secured by a Chicagoland-area campus for a technician training school. Representation of the Milwaukee Bucks NBA team in connection with entering into various agreements with the Wisconsin Center District, City of Milwaukee, County of Milwaukee and Goldman Sachs related to the development and financing of the team’s new arena, parking facilities and practice facility. Representation of a private equity firm in connection with a loan secured by a full-service boutique business hotel and restaurant in Chicago, Illinois. Representation of a real estate client in refinancing a portfolio of discount motels in Illinois. Representation of a private equity firm in connection with obtaining a loan secured by a multifamily apartment complex in Gurnee, Illinois. Representation of an institutional investor in refinancing a portfolio of select service hotels in Illinois. Representation of a real estate client in obtaining a loan to finance a portfolio of industrial warehouse and distribution centers in Atlanta, Georgia. Representation of a public company client in connection with the acquisition, and simultaneous origination as ground lessor of a 99-year ground lease, of a value-add medical office building in Alpharetta, Georgia, together with a related easement agreement granting the client a right to provide additional funds under the ground lease for the potential future construction of additional medical office buildings on the ground-leased site and the adjacent site. Representation of a public company as lessor in a bondable lease for a build-to-suit development of a Chicagoland-area campus for a diesel/automotive training school. Representation of a high-net-worth individual as buyer/lessor in connection with a sale-leaseback of a medical office building in Columbus, Ohio. Representation of a global privately held company in connection with its sale-leaseback of its global headquarters and research and development facility in Chicago, Illinois, and its sale-leaseback of its European headquarters and distribution facilities in Sittingbourne, United Kingdom. Representation of an institutional investor in a long-term lease as ground lessor for the construction of a 230,000-square-foot state-of-the-art headquarters in Long Island, New York. Representation of an institutional investor in the acquisition of a portfolio of industrial warehouse and distribution centers in the Atlanta, Georgia metropolitan area. Representation of a corporate client in the acquisition of a manufacturing facility just outside of Milwaukee, Wisconsin. Representation of an investment management firm in connection with its acquisition of four industrial warehouses and distribution centers in Tampa, Florida. Representation of an investment management firm in connection with its $20 million acquisition and $14.2 million financing (as borrower) of three industrial warehouses and distribution centers in Richmond, Virginia. Representation of a private equity fund in connection with its acquisition of two industrial warehouse and distribution centers in Joliet, Illinois. Representation of a global privately held company in connection with its disposition of a manufacturing plant in Rolling Meadows, Illinois. Representation of a private equity investment firm in connection with the disposition of $1.5 billion of office properties located throughout the United States. Representation of an institutional investor in the acquisition of the office portion of an historic building in Chicago, Illinois. Representation of a private equity firm in the sale of a Class A office building in the St. Louis, Missouri metropolitan area. Representation of a real estate client in connection with the sale of an office building and adjacent development land in McKinney, Texas.